This is a walk through master closet setup. Located in the Fairfax district in Los Angeles it is one of 5 closets built out. Made from Hard-rock Maple Melamine. It has 1/4″ backing. Fixed Round Rods. Blum Soft Close drawer slides and Decor-form drawer faces. One side was designed with drawers and shelves for folded clothes and shoes. The other side was designed for hanging. The client was 6’2″ so the drawers are large. We installed two plunge locks to add some security to the set up. The System was designed to take advantage of a tall ceiling . This allowed more space for the clients longer shirt tails and jacket tails. Flat crown moldings were used at the ceiling and a more traditional base molding was used at the floor. 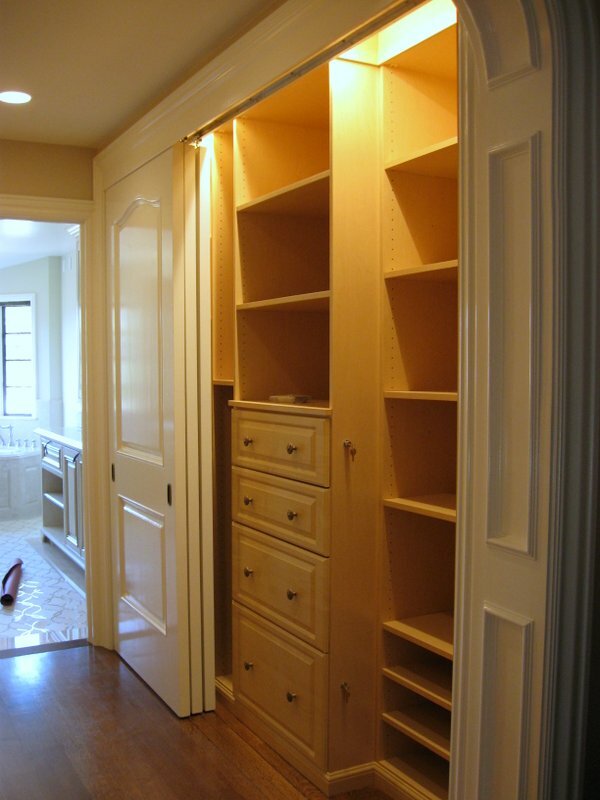 Transform your walk through closet into your dream space with a custom closet solution from The Closet Guy. With over 40 years of experience building walk in closets in the Greater Los Angeles area, I work closely with our customers to design, build, and install only the best quality cabinets at a fraction of the price of other companies. By handling the entire process myself, from consultation to installations, I eliminate extra overhead and pass that saving on to you.